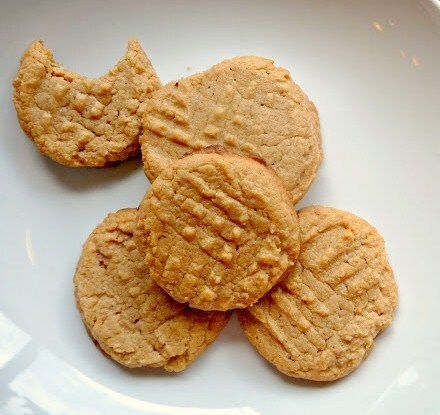 For all you peanut butter junkies out there, I have a super easy and very tasty recipe. A cookie with just 3 ingredients! All you need in your cupboard is one egg, sugar and peanut butter. The cookies turn out really nice, with a lovely texture. Preheat the oven to 325 F (or 160 C). Line a baking tray with parchment paper. Mix the sugar and peanut butter. Mix untill combined. In a small bowl, crack the egg and beat lightly with a fork. Add the egg to the peanut butter mixture. Continue stirring untill the egg is incorporated into the mixture. Cover with plastic wrap and refrigerate for at least 30 minutes. After removing from fridge, scoop out small balls of dough and flatten them out. Space the cookies about 2 inches apart. With a fork, make a criss-cross pattern on the dough. Place into the oven for 20 minutes. Let them cool on a cooling rack. For an added texture/flavour, you can add some chocolate, by melting some chocolate in a bowl and dip the cookies in the chocolate. Enjoy! Thanks Amanda! How did they turn out for you? Did you like them? I love the texture alot, hope you do too! Definitly adding this to fav, perfect for when you have a craving for something freshly baked but don't want to go to the supermarket! haha.